A movie-based book app with no interactivity, no animation, and missing the voices of the characters. The Peanuts Movie Official Storybook App is a barebones book app based on The Peanuts Movie. 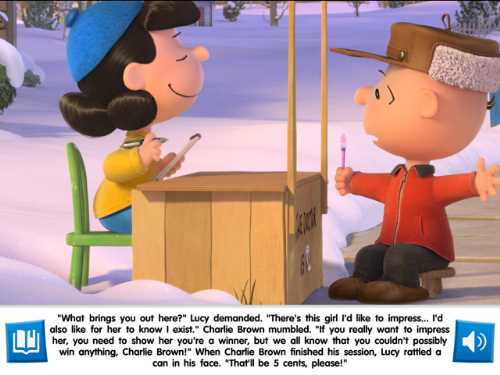 It tells a shortened version of the movie's story about Charlie Brown's quest to be a winner in order to impress the new little red-haired girl who has moved in next door. 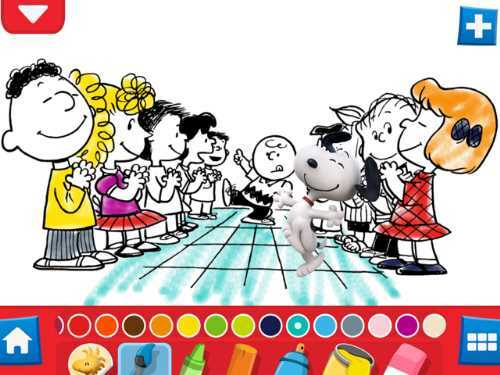 This book app uses artwork from the film, so the Peanuts characters appear vibrantly more real than when seen in Charles Schultz's beloved comic strip. The 19-page book is read aloud by a narrator as the words highlight. Or kids can choose to turn off the narration and read the story themselves. At the end of the story, kids can color six different scenes. For those used to being transported into an exciting, interactive world by opening a book app, (see Billy's Coin Visits the Zoo or Weirdwood Manor), don't expect that kind of experience here. This is a no-frills book app. The pages have no interactivity, and the characters don't animate. You won't hear the voices of the characters (a big loss!) and there aren't any sound effects to help bring this world to life. When tapped, the words don't say their names, and young readers can't record themselves reading. You just get the book read aloud by a so-so narrator with word-hightlighting. The addition of coloring pages at the end of the book does provide a way for a child to explore some creativity; but with only six pages, that creativity is limited. 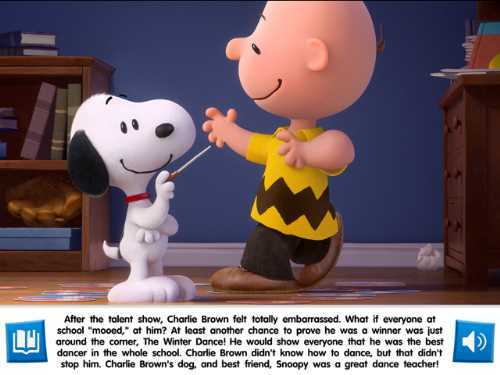 The Peanuts Movie Official Storybook App does deliver a story with a positive message. 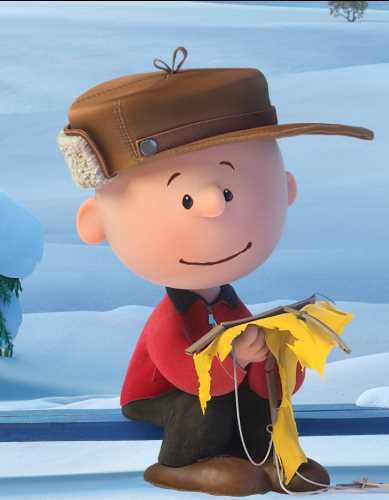 Charlie Brown tries to show that he is a winner: from entering the Talent Show and a dance contest to trying to excel at flying a kite and getting good grades. 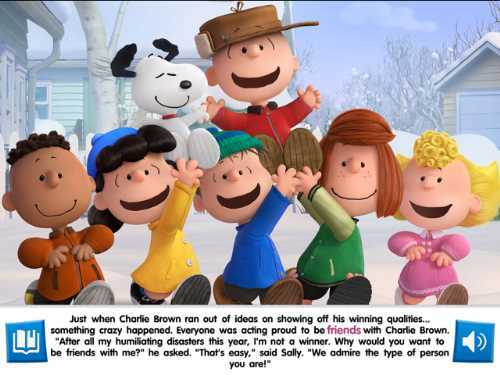 In typical Charlie Brown fashion, things never go according to his plans, but Charlie Brown shows that he is kind, loyal, brave, and honest in the face of adversity. The story ends with his friends celebrating his inner goodness. 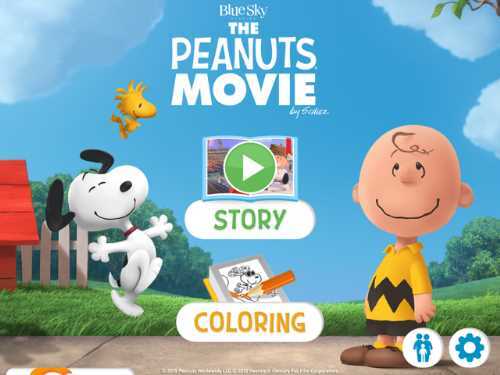 The Peanuts Movie Official Storybook App is best for families looking to familiarize their young children with the characters and theme of the movie before attending it. After seeing the movie, this book app may seem a little bland. For better Peanuts-based apps, check out Charlies Brown's All-Stars!, A Charlie Brown Christmas, and Snoopy's All Star Football. This The Peanuts Movie Official Storybook App review was written by Jinny Gudmundsen.